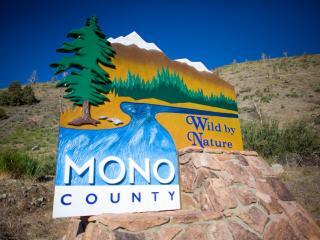 Blessed with an abundance of public lands, Mono County offers excellent bird watching.The top areas for bird watching in Mono County are listed below. Please also see the Eastern Sierra Birding Trail Map published by the Mono Lake Committee, the Eastern Sierra Audubon, and the Owens Valley Committee. 15 mile stretch of valley with the West Walker River running through it that starts on Hwy 395 at Mountain Gate Park and ends at Topaz Lake. Encompassing riparian, sage, Pinyon Pine and coniferous forest habitat along with a lake and bridges where a variety of migratory and resident birds can be seen such as White Pelicans, Long Billed Curlews, Sandhill Cranes, Lewis' Woodpeckers, Lazuli Buntings, Lark Sparrows, MacGillivray's Warblers, Spotted Towhees, Pinyon, Steller's and Scrub Jays along with an abundance of raptors in the winter months. Sonora Pass; Junction of HWYS108 and 395; across from US Marine training base. 990 acres of Jefferey pine and riparian habitat. Two lakes, streams, rivers and springs all within this area. This fawning habitat is home to waterfowl and the bald eagle. 8 miles S of Bridgeport on Hwy 395 to Green Creek Rd. 720 acres of Aspen, Jefferey pine and riparian habitat. Sloping valleys with an elevation up to 7,400 feet. Bald eagle are found here. South of Bridgeport on HWY 182. A waterfowl watcher's paradise. Western grebe's, shorebirds, American white pelican, bald eagle, rough -egged hawk, northern harrier. The ghost town of Bodie sits atop a high, windswept plain, good habitat for sage grouse, mountain quail, sage thrasher, green-tailed towhee, mountain bluebird, green-tailed towhee, mountain bluebird, brewer's vesper, and sage sparrows. A trillion brine shrimp and millions of alkali flies feed 70 species of migratory birds including 1 million eared grebes, 50,000 California gulls, and thousands of killdeer, Wilson's and red-necked phalaropes. Osprey's often nest on top to the Tufa towers just offshore. South of Lee Vining, on HWY 120. Take 120 west for 3.2 miles, turn left at the Poole Power Plant Road, then right at the T-intersection. Riparian habitat that snakes alone the glacial canyon. Woodpeckers, swallows, mountain bluebirds, warbling vireo, yellow warbler, black-headed grosbeak, townsend's solitaire, hermit thrush, yellow-rumped warbler, western tanager, chipping sparrows, mountain chickadee. Hike up one of the loop's trails to see High Serra birds like Clark's nutcracker, mountain chickadee, brown creeper, nuthatches, western tanager. Osprey from Mono Lake come to June for trout in Grant and June Lake. Grant Lake is home to loon and diving ducks in the fall, and in the winter Bald Eagles take up residence in the loop. Between June Lake Loop off HWY 395, at Obsidian Dome Road. Volcanic ejecta mingle with old-growth red fir to create a habitat for white-headed, black-headed, and hairy woodpeckers, williamson's and red-breasted sapsicker's, pine grosbeak, and northern goshawk. A high alpine scenic hideaway where you can see spotted sandpiper, pine grosbeak, nuthatches, and chickadees. Ponds and a wetland that attract mallards, cinnamon teal and ring-necked ducks, Canada geese, American avocets, killdeer. Look for sora (common rails) hiding in marsh vegetation, overhead for prairie falcons, golden eagles and rough-legged hawks, and in open sage flats for sage thrashers, sage sparrows and sage grouse. Between Mammoth and Bishop on HWY 395. Turn east on Benton Crossin Road. Popular lake for fishing, and home to rare bank swallow. Fall and winter it is a great place to see loons, ducks, eagle, and shorebirds. Crowley is home to the greatest population of wintering Bald Eagles in the Eastern Sierra.